How is crusted scabies transmitted? If scabies goes untreated during the initial stages then it may turn complicated which is known as Crusted scabies. Also known by the name Norwegian scabies it is the most severe and contagious form of scabies. It is caused due to uncontrolled proliferation of the scabies mite which results into millions of mites all over the body. The following article is based on the causes and treatment of crusted scabies. Crusted scabies is a highly contagious from of scabies which is characterized by crusted lesions. It affects people with weakened immune system such as HIV+ people. The mites reproduce in the space between the fingers and the toes, underarms and the groin region. When the person is infected with crusted scabies, he becomes vulnerable to many other secondary infections. Let’s us have a look of what causes crusted scabies. Crusted scabies happens due to infestation of the same mite that causes the classic scabies. Sarcoptes scabiei var hominis is the main parasite that grows in the outer skin layer of the human body and is the main cause of scabies. It is the female mite which burrows in the surface of the skin to lay eggs and infect the whole body. The female mite lays 2 to 3 eggs per day which takes around 3 to 4 days to hatch and form scabies. In case of crusted scabies, there are millions of mites all over the body and the growth rate is drastically high in case of crusted scabies. The saliva of the mite contains the antigen that triggers the development of crusted scabies. If the person has a weak immune system, it is not able to control the proliferation of the mite which results into crusted scabies. The ones with highest vulnerability to crusted scabies are the ones having poor immune system, infected with neurologic diseases, people with mental incompetence and HIV patients. 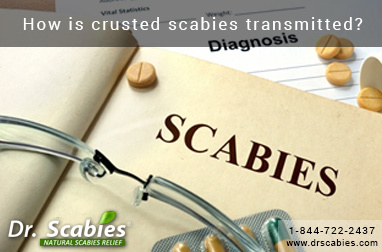 Crusted scabies can be transmitted through direct or non-direct contact with the affected person. If you happen to come in close contact (such as hugging and sexual contact) with an infected person then you are likely to catch scabies infection except if you start with the treatment on time. Another cause of transfer of scabies is due to sharing of personal belongings such as bed sheets, handkerchief or any of the patient’s belongings can provide space for transfer of mites between the infected and non-infected person. Following are the medicinal ways to treat the crusted scabies. It is utmost important to isolate the patient of crusted scabies so that the person is protected from secondary infections and also to prevent the spread of the disease that can result in an outbreak. And for people who are in contact with the patient of crusted scabies such as the medical staff or family members should also be treated equally for the disease. Treatment of crusted scabies becomes difficult, if the person has a weakened immune system. Topical scabicidals are the most preferred way to treat the crusted scabies as they can be absorbed in the skin properly and kill the mites. Broad spectrum antibiotics are recommended for crusted scabies patients with secondary infections especially those infected from septicemia. Another form of treatment for crusted scabies is based on to provide relief from dry skin and excess of itchiness. Ivermectin is the drug which can eliminate the scabies mites and also help the person to get rid of the scabies mite. It is taken orally and is highly effective for killing the mites. It is a safe drug which can also be used in combination with other scabicidals for an effective and quick treatment. What can be used to treat scabies naturally? How to Treat Scabies Itch?